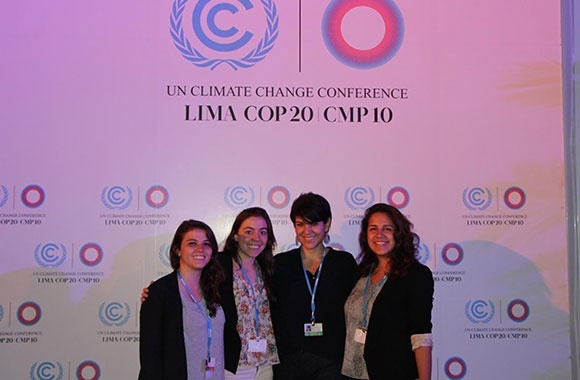 Maria Camila Bustos ’16 wants environmentalism to become mainstream. As Executive Director of EmPOWER, Brown’s umbrella environmental organization, she hopes to get students fired up about climate change with an evening of speakers and live music on the Main Green on Friday, October 2. Brown is one of more than 50 universities around the country staging events as part of Know Tomorrow, a national student-led day of action on climate change started by Cool Globes founder Wendy Abrams ’87 and Al Gore’s Climate Reality Project. The evening’s lineup features several bands including What Cheer? Brigade, Young Hummus, Sons of Providence, Sports Footage, and Sebastián Otero. Human Rights activist Kerry Kennedy will speak, as will Voces Verdes: Latino Leadership in Action. A video message from Senator Sheldon Whitehouse will address the role of young Americans in the fight against climate change. Unrelated to the Know Tomorrow concert, a Saturday conference will follow: the Rhode Island Youth Summit on the Environment (RYSE), which started last year. A keynote speaker from Voces Verde will address participants over a lunch of flatbread pizza, says Bustos, and workshops will include “Understanding the New Energy Marketplace”; “Illicit Economies and Environmental Degradation in the Global South”; “Resistance to Fracked Gas Infrastructure in RI”; and “How Environmental Justice Can Become Racialized and What We Can Do About It.” “Diversity and the Environment: A Call to Action” will examine why minorities are underrepresented in environmental organizations and institutions. Focusing on climate change is not new for Bustos. She received a Royce Fellowship to conduct research on her thesis topic, Colombia’s Foreign Policy on Climate Change. Last summer she interned for Dejusticia, a human rights think tank in Bogotá, where she wrote a case study about human rights and coal extraction. During the previous summer, she worked with Timmons Roberts, Ittleson Professor of Environmental Studies and Sociology at Brown, on Rhode Island’s first climate change law, the Resilient Rhode Island Act of 2014.